Looking to unwind and toss a few axes with friends? Aim here. From the cat café to the hookah bar, and from the escape room to the wine-and-paint party, every year seems to usher in another inventive retail concept. Each of those options seems tame compared with the latest craze: hurling axes at wooden targets, in an establishment known as an ax-throwing bar. Yes, that’s now a thing. The ax can be traced to prehistoric times, so it should come as no surprise that humankind has since dreamed up ways to employ it for uses beyond just felling a tree. In the Greater Philadelphia Area, a growing number of ax-throwing hot spots—most of them BYOBs—teach patrons how to properly toss a projectile of metal and wood, and then pits enthusiasts against one another in tournament-style play. For those who really enjoy the sport, some of these establishments even offer competitive leagues. Throwing an ax at a wooden target might sound macho, primal, and even a little dangerous, but it’s completely safe and well supervised, according to Howard Klotzkin, a partner with Bury the Hatchet LLC, which has locations in King of Prussia and Princeton, N.J. In fact, he says women enjoy the activity just as much as men. Walk-ins are welcome, but available lanes (more like batting cages, really) tend to fill up quickly, so reservations are recommended, especially on weekends. The sport has become so popular that the field of ax-throwing destinations continues to grow, both in the city and on its outskirts. Bury the Hatchet has another location coming soon in Horsham, for example, while a Brooklyn-based outfit called Kick Axe Throwing looks to open a new location in Old City Philadelphia this spring. 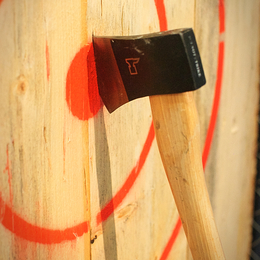 Here’s a working list of local ax-throwing bars currently putting hatchets in patrons’ hands.